Patel Conservatory Outreach Program Gives Life Skills to Adults with Disabilities – What Will My Gift Support? The other adults in the circle with Amanda smile and nod, telling her how good she’s doing. In unison, they circle their arms and say, “AMANDA. ANGRY.” Then the whole group dissolves into peals of laughter. The next person, Walter, shakes his hips. He’s silly. The next is Patricia, who gives a double thumbs-up, she’s excited. They take turns: sad, shy, joyful, mad. After every person, the group laughs and applauds. 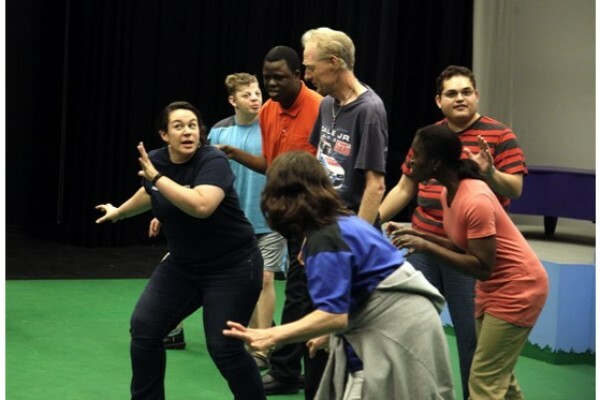 So goes another monthly workshop at the Patel Conservatory for the adults at MacDonald Training Center (MTC), a Tampa-based non-profit which serves adults with a wide variety of intellectual, developmental and physical disabilities. Through their games and improv in this hour, these loving, lovable adults learn emotional cues, positive responses to unexpected change and collaboration—all skills they need to land a job, stay employed and live with independence. MTC offers many excellent services, but they do not have enough funding for an arts program. Seeing the invaluable benefit of arts education to MTC’s mission, The Straz welcomed them as a community partner in 2009 to help them meet this need. Funded by annual donors, the Straz Center’s community partnership program places much needed resources—faculty and curriculum—with organizations and people who need them most. You see, every day, far from the footlights and spotlights of our main stages, the Straz Center is hard at work improving the quality of life for an untold number of people throughout the Tampa Bay area. Engaging in the arts saves lives, changes lives and spreads joy from one person to another. For the adults at MacDonald Training Center, Straz Center annual donors give them the power to write their own stories and affect other lives, so our million little stories become a million more. Help us continue to provide transformative outreach opportunities like this one by making a gift to the Straz Center today.